ESCONDIDO, CA (Oct. 5, 2015) – To highlight the homebrewing talent that helps foster innovation among the craft beer community, Stone Brewing Co. hosts an annual Stone Homebrew Competition & American Homebrewers Association (AHA) Rally. This year’s prize-winning contender was created by Juli Goldenberg, QUAFF (Quality Ale and Fermentation Fraternity) homebrew club member and founder of the San Diego Suds Sorority. San Diego-based Monkey Paw Brewing Company was later asked to complete the collaborative trifecta. 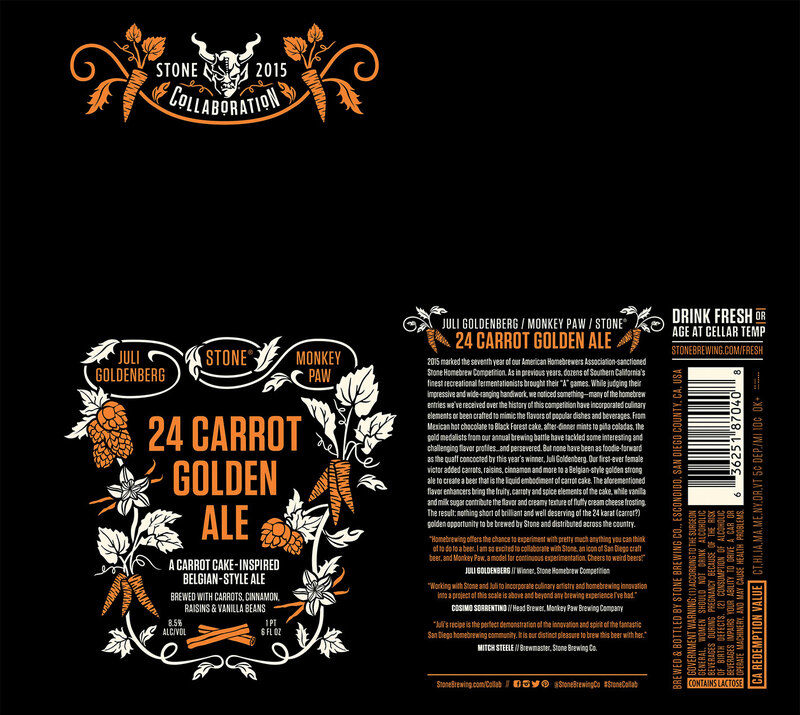 A creative recipe inspired by carrot cake, Juli Goldenberg/Monkey Paw/Stone 24 Carrot Golden Ale is a Belgian-style golden strong ale infused with carrot juice, milk sugar, raisins, cinnamon and vanilla beans. 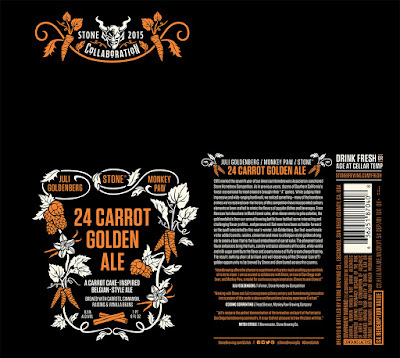 Today, the latest Stone Collaboration beer will begin arriving in 22-ounce bottles and on draft at retailers, restaurants and bars in markets where Stone beers are sold. Earlier this year, 27 talented participants vied for the prize: the opportunity to have their imaginative creation brewed on Stone’s large-scale, 120-barrel brewing system and distributed nationally. After AHA members submitted selections for a top pick, a panel of judges—Stone co-founders Steve Wagner and Greg Koch, Craft Beer Ambassador “Dr.” Bill Sysak, and members of Stone’s Small Batch Team and Quality Assurance Department—spent a great deal of time and deliberation making sure the blue ribbon went to the most deserving of the bunch. In the end, Goldenberg’s carrot cake-framed Belgian ale earned the top honors, making her the first female brewer to win the competition. When formulating her creation, Goldenberg relied on unconventional brewing ingredients to emulate the rich, complex characters of this dessert. The malt bill provides a perfect backbone for the special ingredients to shine through, while the hops contribute enough bitterness to balance the multitude of flavors and aromas. Raisins, carrots and milk sugar were incorporated during the brewing process, giving way for a medium body that’s creamy and smooth. Vanilla beans and cinnamon were added after fermentation to replicate aroma and taste similar to cream cheese frosting. 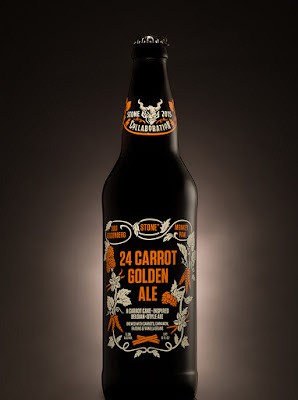 To fully enjoy the beer’s delectable flavors, Juli Goldenberg/Monkey Paw/Stone 24 Carrot Golden Ale should be enjoyed fresh. For those wishing to sit on a goldmine, this golden ale may also be stored at proper cellaring temperatures for several months or years. Over time, the beer will become more refined and smooth as the hop qualities subside. Homebrewers and craft beer imbibers can look forward to future winning recipes from the Stone Homebrew Competition & American Homebrewers Association (AHA) Rally. For 2016, the annual tournament will take place in November at Stone Brewing World Bistro & Gardens - Liberty Station. Once the planning is complete, more information will be available via stonebrewing.com.